Another opportunity to get rid of the House of Lords – lost. Oh, well. At least the Conservatives won’t have an opportunity to flood it with another few hundred unwanted chinless wonders, just to see through their ill-starred ‘Brexit’ plans (whatever they turn out to be). Baroness Smith is right to say the Lords will not block a democratic decision to leave the EU. This still gives the Lords plenty of leeway for argument. For those of you who like nautical metaphors, it has been suggested that the UK is sailing away from the EU and into stormy waters. It seems likely there will be a few squalls before we even leave port. Labour’s leader in the House of Lords has said the party’s peers “will not block” Brexit, in what could be a boost for Theresa May. Baroness Angela Smith said peers had to be “adult” in approaching the issue and that threats over blocking Britain’s EU withdrawal only gave Brexiteers reason to cry foul. Explaining the approach, the shadow Leader of the Lords added: “We have to be adult about this. She said few Lords did not have “genuine concerns” about what she claimed is the government’s “confused and unsettled approach” to negotiations. Baroness Smith also said that while Labour peers would not block Brexit, they did take seriously their responsibility in “assisting the Government to make the best possible arrangements for the UK”. She said peers would use their “expertise and knowledge” to fully understand the implications of Brexit and try to advise the Government on how to address problems. 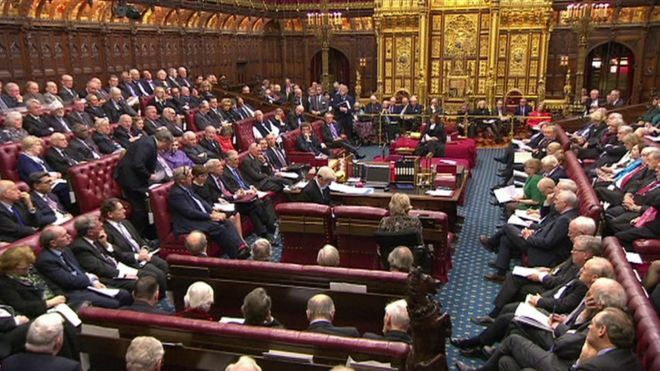 Why shouldn’t the House of Lords represent the 48% of us that voted remain and the 50% of those who voted “Leave” thinking that it meant we would throw out immigrants from Pakistan, India, China and Africa? Returning an unsatisfactory piece of legislation is not the same as blocking. Don’t underestimate the £ords. That said, the £ords shouldn’t worry about Brexiters crying foul! That’s like giving into children, for fear that they will cry. Have the courage of your conviction. Aye, I voted for us to leave, that’s no secret but the process should be proper.